WE HAVE MADE AVAILABLE the following resources, free, for correctional/self-help settings. Our publications stem from need for sociological perspectives and conscientious, critical thought in corrections and from the notion that education is integral to habilitating the majority of offenders and decreases risk to further criminality. 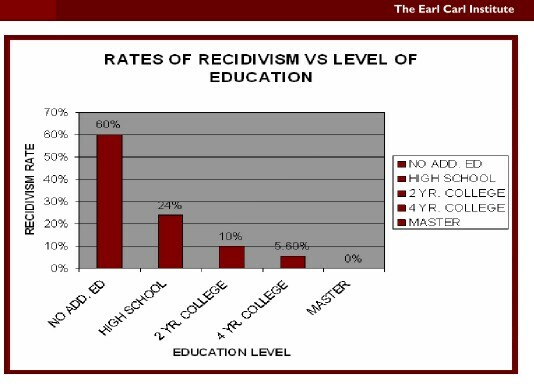 A graduate degree is the Gold Standard for reentry preparedness. The RippleFX Foundation designs programs for corrections which work to dull anti-social behaviors. While not graduate degrees, our programs stimulate educational interest, introspective study, compelling further education. The facility becomes safer for correctional employees, as well, through having positively directed offenders, occupied and invested in fruitful activity. We distribute facilitator guides to train presenters or instructors and the necessary textbooks for the population. Download a sample today, or make an appointment today to begin the approval process at your facility. All books are perfectbound at $13 and free s/h, or sponsor a class of 20 students at $250. All books are free, of course, as downloads, maintaining the formatting of the textbook. 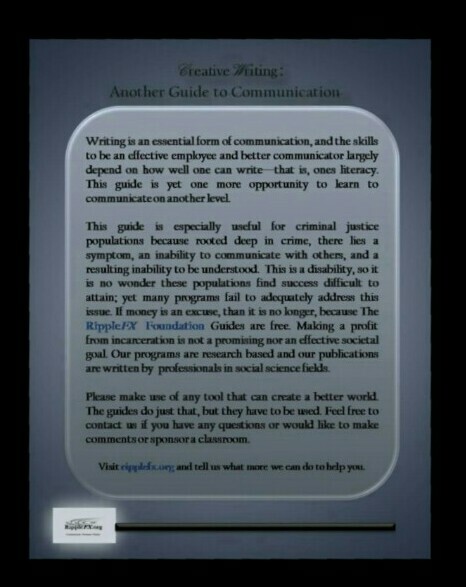 COMMUNICATING BEHIND BARS, 2nd Edition, is an 11~week psychosocial program that serves to heighten prosocial communication among offenders using meaningful role~plays, written assignments, and discussion points which open dialogue amongst students, and challenge normative sub-cultural ideals. 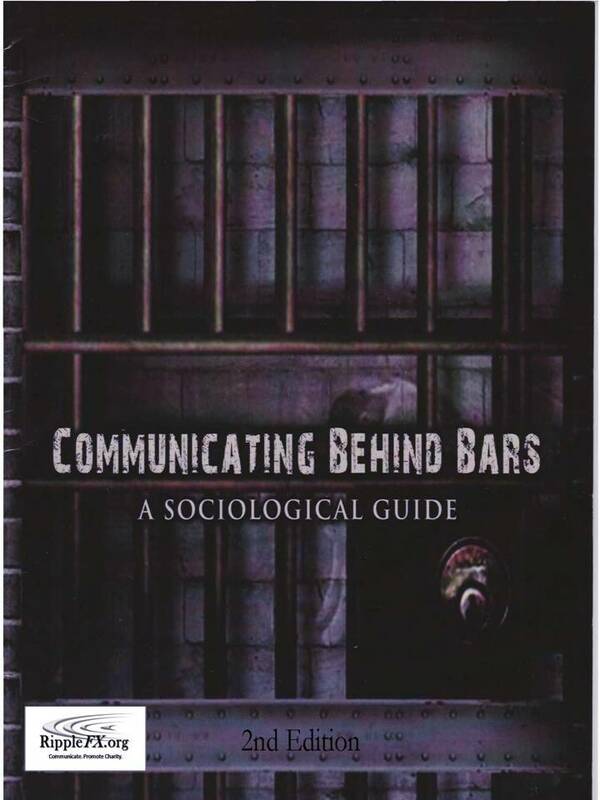 There are chapters on the communication process, roles of prison guards, prisoner~to~guard, and prisoner~to~prisoner relations, and more. This guide advances written and verbal skills, builds critical thinking skills and posits academic challenges to pervading antisocial subcultures. Great reviews! A great program to augment orientation and education. Read the course survey results. Click here to download Second Edition FREE!! Creative Writing Course, download now! Communication is an invaluable privilege and skill that many people fail to develop. However, that is not the end of the story, as we at The RippleFX Foundation believe that providing context for incarcerants to convey their feelings and attitudes in meaningful ways narrows the social gap between people, and reduces adjustment time upon re~entry. This guide, at 63 pages, represents a course equivalent to College Composition 1 classes – reintroduces types of written communication and encourages participation via exercises and examples. The guide makes a great supplemental class for therapeutic communities, group studies, and self~study or partner study groups, and a great augmentation for anger-management courses or educational programs. A great tool for every offender type. This guide, designed for incarcerated individuals who are experiencing the criminal justice system fire the first time and seek to continue positive relations with their children. The guide follows two people having committed two different crimes while they search for and use different approaches to express the social complexities of punishment, and the effects of their own behavior with their surprised families. Narrated, in part, by the offenders themselves. Under 50~pages, the guide is great for family social services, individual study, prisoner classroom/group study, prisoner orientation and even corrections students and employees.